Wisconsin and Purdue will battle for early Big Ten supremacy; plus Georgetown tries to get back on track in the Big East. After a blazing start to conference play the schedule will cool to a simmer this weekend. There are no titanic matchups on tap but there are plenty of intriguing storylines. Will Villanova bounce back from its first loss? Will Wisconsin shrink Biggie? Will Georgetown get off the Big East Schneider? You have come to the right place for the answers. I have seen the future. When picking games, I like to heed two principles: A team that notches a huge win invariably suffers a letdown, and desperate home teams usually win. Butler just scored as big as win as you can get by beating No. 1-ranked Villanova in Hinkle. Now the Bulldogs travel to D.C. to face a Hoyas team that has lost three straight and is already fighting for its NCAA tournament life. Layup. The Mountaineers are coming off an overtime loss at Texas Tech during which their kryptonite was exposed: The Red Raiders only turned the ball over 13 times. The fact that they still needed an extra five minutes to edge West Virginia at home shows just how good this Mountaineers team is. That means this game is bad timing for TCU, which is ranked eighth in the Big 12 in turnovers at 12.7 per game. The Horned Frogs nearly knocked off Kansas at home on Dec. 30 but struggled to beat a mediocre, undermanned Oklahoma team at home by three on Tuesday. The Hokies learned an important lesson on Wednesday night, when they lost by 26 points at NC State: If they don’t play with high-level intensity, they are just another team. Things won’t get any easier in Tallahassee against a squad that has legitimate Final Four potential. Normally, I’d be concerned about the Seminoles suffering a hangover in the wake of their big win at Virginia, but they did not have a midweek game so they’ve had plenty of time to get over that. Sophomore forward Dwayne Bacon scored 26 of his career-high 29 points in the second half of that win. He's a problem. You gotta love the contrast in styles. Creighton is ranked first in the Big East in scoring (88.1), and Providence is ranked last (69.9). The Friars managed to break a three-game losing streak Wednesday night by beating Georgetown at home, thanks to a terrific shooting performance by 6' 7" junior Jalen Lindsey (19 points, 4 for 6 from three). But I believe Creighton, which is still stinging from its loss at home to Villanova on Dec. 31, can handle both the pace and the environment. 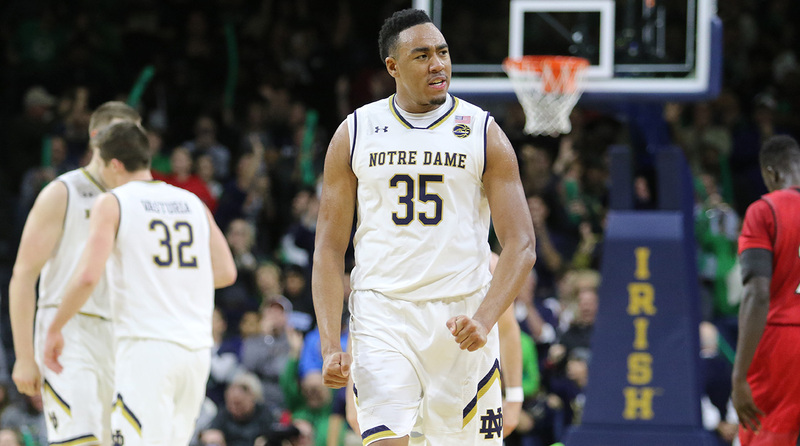 Notre Dame might not have a traditional post player, but it does have a man among men up front in 6' 5" junior forward Bonzie Colson, who had 18 points and 14 rebounds in Wednesday’s win over Louisville. It will be fun watching him battle Tigers senior forward Jaron Blossomgame, but I don’t think Clemson has enough perimeter firepower to keep up with the Irish, especially at home. If this game were being played in late February as opposed to early January, I would probably go with the Terps. As it stands, I don’t think a team that starts three freshmen is quite ready to win this type of road game. Michigan is not going to scare anyone with its defense, but it does conduct an intricate, hard-to-guard offense that forces opponents to lock down the three-point line and be aware of back cuts. Plus, the Wolverines are committing fewer turnovers than any team in the country at 9.1 per game. The Bears got quite a scare at home against Iowa State on Wednesday but managed to win by two. They’re bound to get clipped sometime soon, but if the Cowboys couldn’t knock off a struggling Texas team on the road, I don’t think will be able to pull off the upset in Waco. Oklahoma State is the highest-scoring team in the Big 12 and has the league’s leading scorer in 6' 1" sophomore guard Juwan Evans (19.7), but Baylor should have no trouble slowing the pace and stymying Evans with their zone. Marquette’s a pretty good team, but this is pretty bad timing. Villanova will be coming home still ticked off from that loss at Butler, and the last time the Wildcats played a home game they darn near got knocked off by DePaul. The Golden Eagles are coming off a painful loss of their own after they blew a five-point lead in the final 38 seconds to lose by three at Seton Hall. I’ve seen the Cougars play a couple of times and have been wondering when they are going to notch a breakthrough win. They beat Rhode Island at home by five and a decimated UConn squad by 16 on the road, but they also lost at home by a point to Harvard and got embarrassed by a pretty lousy LSU team in Baton Rouge. I think they will capitalize on this opportunity against a team that will be a comfortable matchup. Houston is ranked 336th in the country in tempo, but it still has two of the top scorers in the American in 6' 2" junior guard Rob Gray Jr. (ranked first in the league at 20.4 ppg) and 6' 5" senior guard Damyean Dotson (seventh at 15.4). I’ve been saying for a couple of weeks the Boilermakers are the team to beat in the Big Ten, and this is their chance to prove it. It won’t be easy since Wisconsin is built for winning on the road, as the Badgers proved by handling Indiana in Bloomington on Tuesday, but I’ll hand my chips to Biggie Swanigan in this one. He is the nation’s second-leading rebounder at 13.0 boards per game, and he ranks third in the Big Ten in points (18.3) and 14th in field goal percentage (54.6).